Traveling to Colorado with my dad and family to hunt elk and mule deer every year was the highlight of my childhood. The experience is what flourished my hunting obsession as an adult. I didn't start hunting on my own until 2002, but it was like a switch flipped in me when I harvested my first Oklahoma buck which scored a 173, and I've been obsessed ever since. We can get over 100,000 trail-cam pictures of deer a week. I look at every one. I recognize deer better than I do people. I can name our shooter bucks even after their antlers drop. 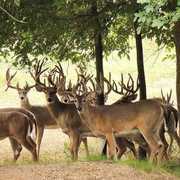 What does it really take to be a great whitetail hunter? You need to understand how big deer behave on your ground. You learn that by fanatically studying the animals-and any girl can do that as well as any guy. Some clients are surprised to have a female guide, but once they get to know me, it's all good. One thing I do get a lot is "Are you the cook?" I can cook. But not during deer season. Hell, yeah, I'm tough. You have to be in this job. Hanging stands, dragging animals, hauling client's stuff 20 feet into trees it's what I live for. I love getting people on big deer. A mature whitetail buck just jacks people up. I've seen grown men cry and been blessed with a child's first deer and all the emotions surrounding the harvest. Women hunters tear each other down worse than the guys-over the color pink, over wearing makeup, and on and on. For any girls out there confused about who they should be or how they should look while hunting, here's what you do: You just be yourself. Don't let hunting or other hunters change you. I think it's important for people to see badass female hunters. Maybe it helps change perceptions a little. Wish I could hunt with you some day! Way to go! This is important for our sport's future.